What Day Of The Week Was January 7, 2010? 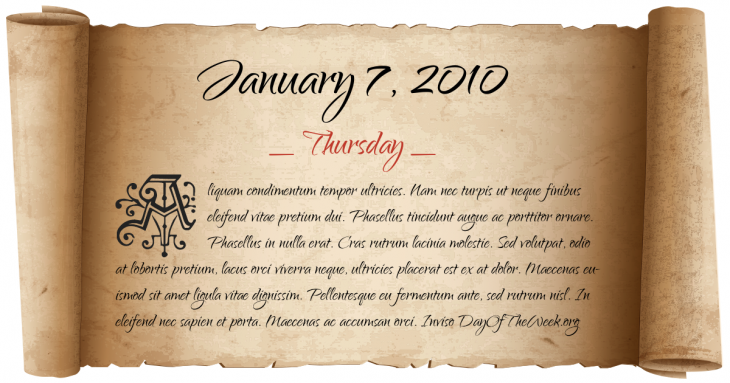 January 7, 2010 was the 7th day of the year 2010 in the Gregorian calendar. There were 358 days remaining until the end of the year. The day of the week was Thursday. A person born on this day will be 9 years old today. If that same person saved a Nickel every day starting at age 5, then by now that person has accumulated $78.30 today. Muslim gunmen open fire on a crowd of Coptic Christians leaving church after celebrating a midnight Christmas mass, killing eight of them as well as one Muslim bystander.